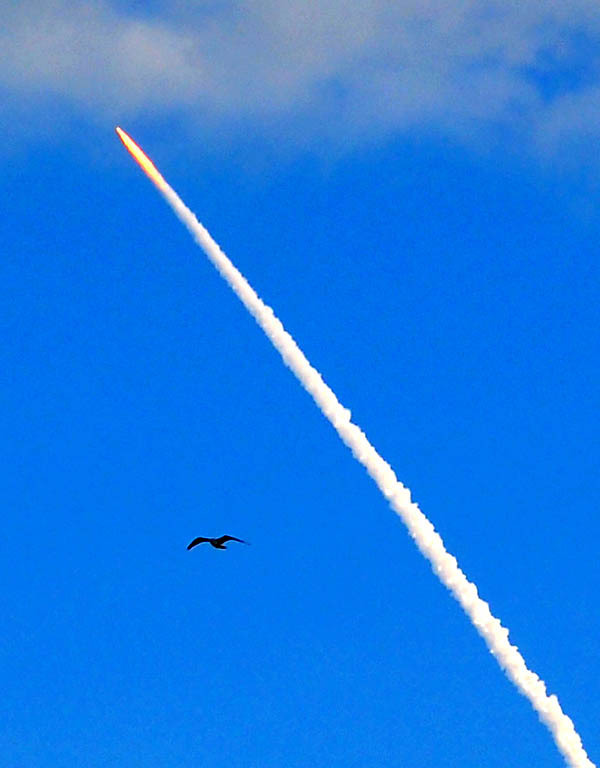 It is not like being at Kennedy Space Center, but we had a nice view of the first few seconds of Discovery’s last trip. We have been at Daytona Beach for the past two days. I think this is about 45 to 50 miles north of the Kennedy Space Center. Discovery's last trip. Photo by Ferrell Jenkins. Feb. 24, 2011. We took our two sons to see the Apollo 11 blast-off almost 42 years ago. See photo here. Trust each of you have your sights set on something higher. In the previous post we wrote about the account of some men putting a hole in the roof of the house where Jesus was teaching in Capernaum. Our photos illustrated the way roofs were constructed at the time. 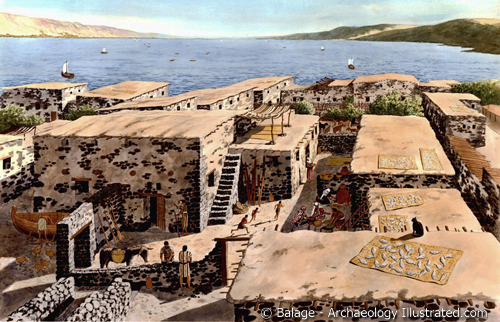 This art by Balage Balogh of Archaeology Illustrated shows clearly the roofs. You can see the flat dirt roof with the poles (we might say rafters) showing under the surface. Other biblical passages become clear when we understand the nature of house construction during Bible times. Take a look at Proverbs27:15. Think of what the winter rains might do to one of the roofs of the day. One of the Psalms of Ascent calls for the overthrow of those who hate Zion. Their residents are powerless, they are terrified and ashamed. They are as short-lived as plants in the field, or green vegetation. They are as short-lived as grass on the rooftops when it is scorched by the east wind. (2 Kings 19:26 NET = Isaiah 37:27). The following paragraph by M. J. Selman in the New Bible Dictionary, 3rd ed., provides a good summary about houses in Bible times. Many houses had two storeys, though, since no building in ancient Israel has yet been preserved with a complete roofed ground floor or ceiling, the original height of a building is not always certain. Upper rooms were reached by stairs or ladders. These rooms provided the main living and sleeping accommodation (cf. 2 Ki. 9:13, 17), and guests could also be looked after there (1 Ki. 17:19; 2 Ki. 4:10-11). Roofs were constructed from beams covered with branches and a thick layer of mud plaster, though the rafters were sometimes supported by a row of pillars along the middle of the room. Cylindrical stone rollers about 60 cm. [23.6 inches] long were used to keep the roofs flat and waterproof, though roofs needed to be re-plastered annually prior to the rainy season to seal cracks which had developed during the summer heat. 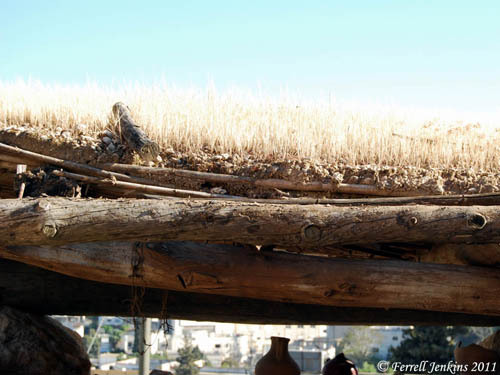 The family would often sleep on the roof in summer or use it to dry raisins, figs, flax, etc., in the sun. A parapet was to be built as a safety precaution according to Dt. 22:8. Vaulted roofs were certainly in use in Palestine by the Persian period, while the tiled roof also appeared before NT times. The rooftop was also a place of worship, either for Baal and especially the host of heaven (Je. 19:13; Zp. 1:5), or for the true God (Acts 10:9). 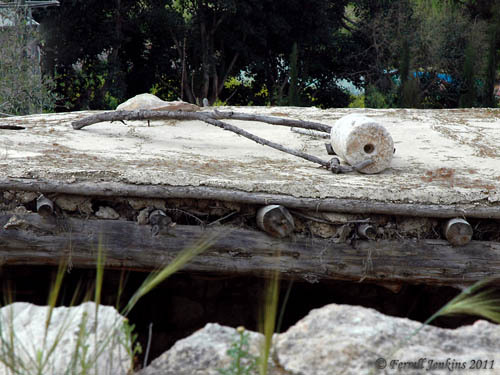 The first photo shows a portion of a roof made from wood and mud. You will also notice a roof roller on the roof. After the winter rains it was necessary to roll the roof. Typical roof from NT times with roof roller. Nazareth Village. Photo by Ferrell Jenkins. The next photo shows the roof a little later in the year after grass has grown on the roof and died under the summer heat. Typical of a roof from NT times with grass growing on it. Nazareth Village. Photo by Ferrell Jenkins. From the inside of the house the ceiling might look something like this. 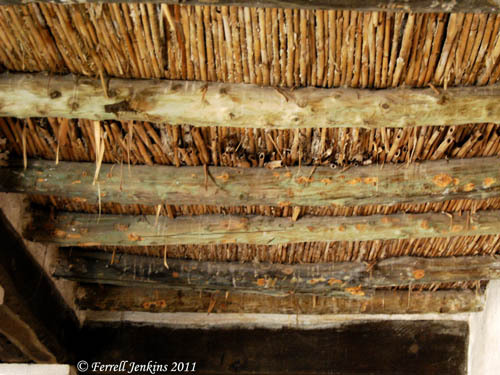 Ceiling of roof made of timber and reeds. Nazareth Village. Photo by F. Jenkins. Notice the New Testament texts implying such a roof. The account of Luke, a gentile physician, adds an interesting point that creates a small problem in interpretation. Did you notice the reference to roof tiles? One of the Translator’s Notes in the NET Bible discusses this problem. There is a translational problem at this point in the text. The term Luke uses is keramos. It can in certain contexts mean “clay,” but usually this is in reference to pottery (see BDAG 540 s.v. 1). The most natural definition in this instance is “roof tile” (used in the translation above). However, tiles were generally not found in Galilee. Recent archaeological research has suggested that this house, which would have probably been typical for the area, could not have supported “a second story, nor could the original roof have been masonry; no doubt it was made from beams and branches of trees covered with a mixture of earth and straw” (J. F. Strange and H. Shanks, “Has the House Where Jesus Stayed in Capernaum Been Found?” BAR 8, no. 6 [Nov/Dec 1982]: 34). Luke may simply have spoken of building materials that would be familiar to his readers. There are other possible interpretations, but I hope this information with the photos will help you better understand the biblical text. 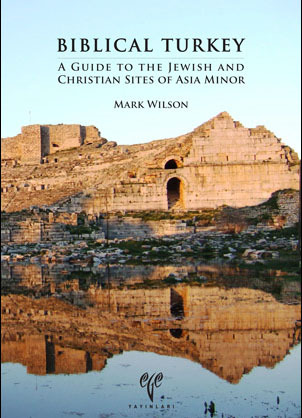 Mark Wilson’s book on Biblical Turkey: A Guide to the Jewish and Christian Sites of Asia Minor is now available through Amazon. Use this Amazon link to order. A little over two months ago I started a post about Wilson’s book, intending to write a brief review. I see now that A. D. Riddle has written a review over at the Bible Places Blog. I direct our readers to that post for more info about the book. Since 2003 we have had A Guide to Biblical Studies in Greece and Turkey by Fant and Reddish. Now we have a book by Mark Wilson that is superior in several ways. Wilson includes sites not mentioned by Fant and Reddish, and his book contains an abundance of color photos. Every person who plans a trip to Turkey to visit Biblical sites should study both books. Dr. Wilson proudly displayed his book at the SBL meeting in Atlanta last November. Mark loves Turkey and its biblical sites. For several years he has spent at least half his time studying and exploring in Turkey. 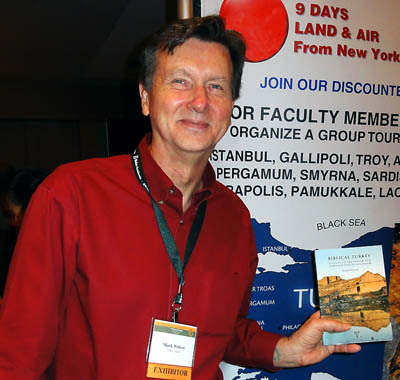 If you wish to know about the biblical sites of Turkey, you will enjoy this book. Mark Wilson shows his book at SBL in Atlanta. Photo by F. Jenkins. Dr. Wilson spoke to one of my groups in Izmir in 2008. See here. Word comes today of the passing of Prof. Anson F. Rainey. He was Emeritus Professor of Ancient Near Eastern Cultures and Semitic Linguistics, Tel Aviv University. He taught in some of the most prestigious programs both in Israel and the United States. One might disagree with his conclusions, but you never went away wondering about his position. A list of his publications and teaching positions may be found at the website of the Department of Archaeology at Tel Aviv University here. I am delighted to have an autographed copy of The Sacred Bridge. In the general category of Bible Atlases it stands in a field by itself as the most thorough and comprehensive. Todd Bolen said the book is “probably the most important work of historical geography ever written” while admitting that it is over the head of most students, and sometimes his own. See here and here. 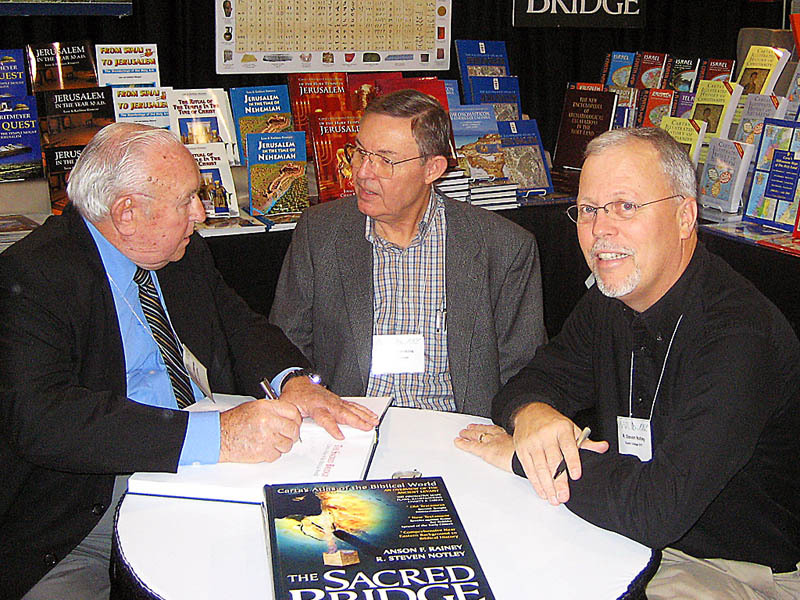 Anson Rainey, Ferrell Jenkins, and Stephen Notley at SBL, 2006. Donkeys are mentioned throughout the Bible beginning in Genesis 16:12. 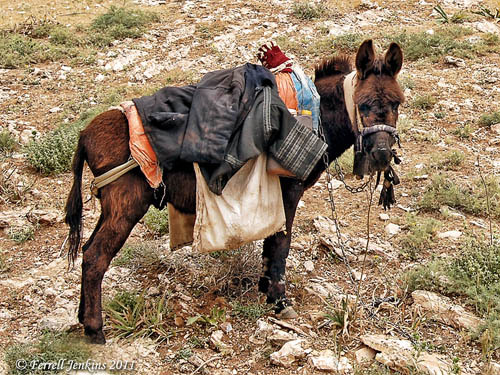 This photo shows the donkey belonging to a shepherd in the area of Gilead in Transjordan. A donkey in Gilead (Transjordan). Photo by Ferrell Jenkins. Abraham took a donkey when he went to the land of Moriah to offer Isaac. Jesse loaded a donkey with food supplies to send to Saul when the Israelites fought against the Philistines in the Valley of Elah. 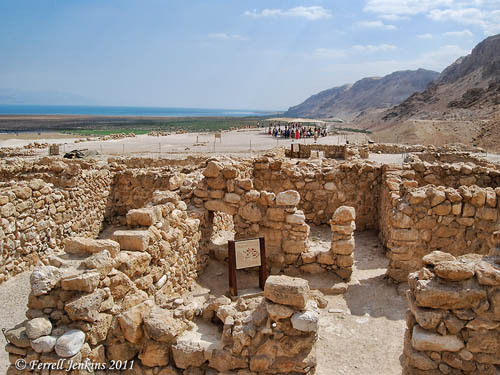 February 15 was an anniversary of the discovery of Qumran on the shores of the Dead Sea. Note the article in The Jewish Chronicle Online. In 1949 the site was identified by European and US archeologists, and on February 15 1949 a team lead by Roland de Vaux and Gerald Lankester Harding began excavating the area. The excavations continued until 1956. The article does not say that east Jerusalem and Qumran was part of the Hashemite Kingdom of Jordan at the time, or that G. Lankester Harding was the Director of Antiquities. He is author of The Antiquities Of Jordan . Qumran study room. NE view to Dead Sea. Photo by Ferrell Jenkins. The sign in the proposed Study Room is shown below. 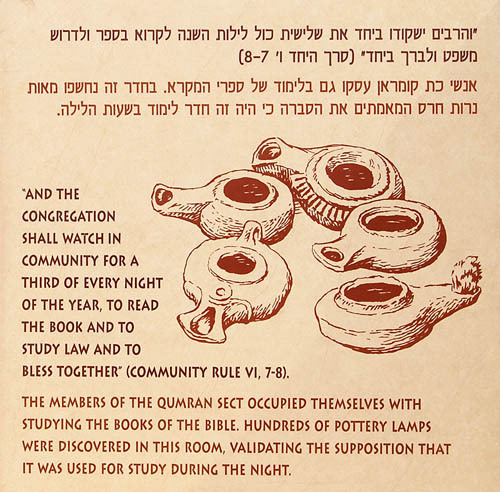 Sign in Qumran Study Room. Photo by Ferrell Jenkins. Haaretz added that “we have learned from reliable sources that $1 million was requested for the scrolls, but they were purchased for slightly more than $250,000,” a “bargain,” according to archaeologist Prof. William Albright, who played an important part in their acquisition. We have written about Qumran and the Dead Sea Scrolls many times. Just use the search box to locate the articles, or begin here.